The Oswego Municipal Airport is located about 3 miles east of Oswego on Highway 160 in Cherokee County. Recently construction of a new road leading directly into the airport was completed. The Oswego Airport now has available building sites for hangars. 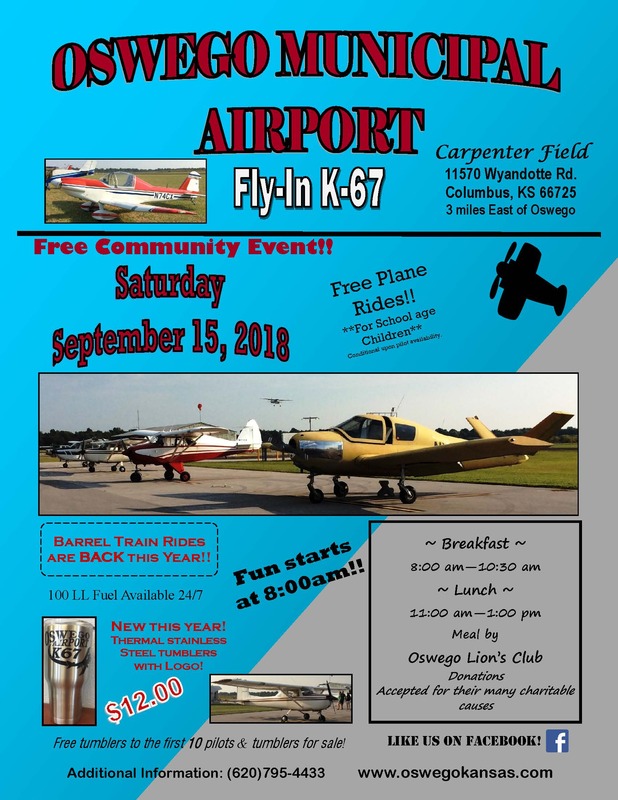 If you are interested in building a hangar contact the City Office at 620-795-4433. The city currently has one hangar on site with space for three aircraft. A private hangar is also on site and houses three or four aircraft. AIRPORT FUEL:The Oswego Airport has 100LL Aviation Fuel. The current price is $4.50 per gallon. The fuel is self-serve and available 24 hours a day. 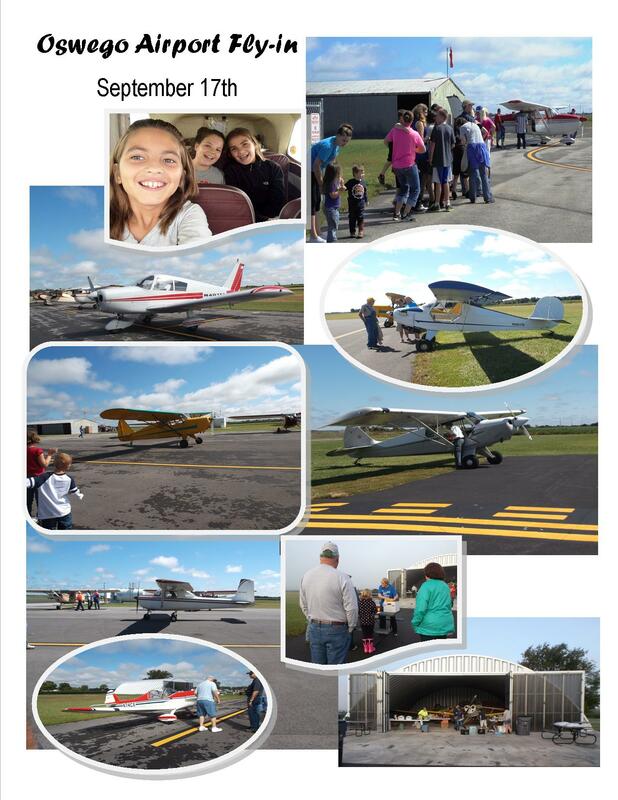 This year's fly-in will be Saturday, September 15th. NEW this year! There will be FREE tumblers to the first 10 pilots who fly-in. The Thermal Stainless Steel Tumblers will also be on sale for $12. There will be FREE PLANE RIDES for school age children as long as pilots are available. Breakfast will be served 8:00 am to around 10:30 am. Lunch will be available 11:00 am until 1:00 pm. The Oswego Lions Club is providing the meals and will be accepting donations. Airplane enthusiasts will be able to check out the recent construction at the airport. A new hangar has been added as well as new tie downs and an apron for new hangar building sites. So come out and enjoy the fun! on the fourth Tuesday of each month at 7:00 p.m. at Oswego City Hall, 703 Fifth Street. Members are Charles Stone, Chair; Tom Bringle, Jane Rea, John Williams, Karen Garza, David Cobb and Clifford Nading.